Trying to have conversations about saving, spending and planning for retirement is infinitely more difficult and more stressful without accurate numbers in front of you. You fall back on anecdotes and feelings because you have nothing else to go on. Conversations start with phrases like: “it feels like we haven’t spent much on eating out this month” and they don’t get any better from there. My wife and I have two beautiful boys, aged 1 and 3, and we’re both ambitious with our careers and work full-time. Life is crazy, crazy busy for us right now. We’ve found it challenging to find time to manage our family finances, so we’ve been in this position of flying blind without a financial tracking plan in place. We’ve had those frustrating conversations, knowing that if we had better insights into our financial habits we could do a much better job at financial planning. I want to show you how we changed that. 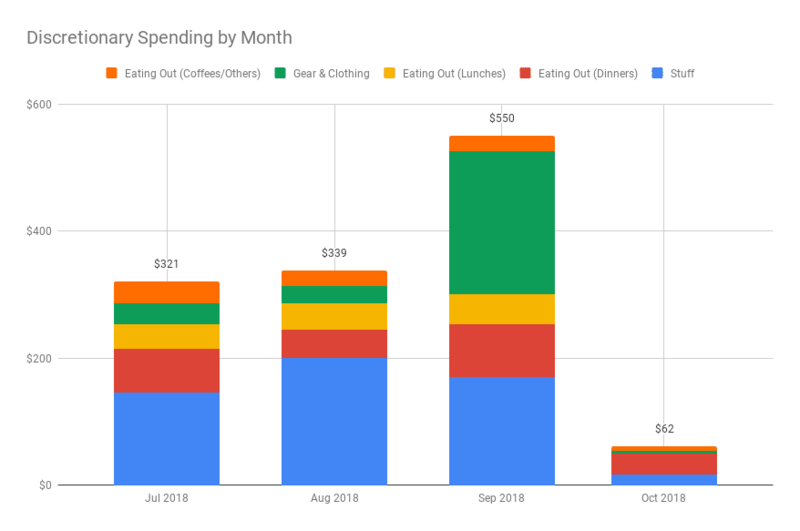 How we created a system in Google Sheets for tracking our spending habits. It now only takes us about 10 or 15 minutes each week, so we can focus on understanding our financial situation better, and maximize our saving. 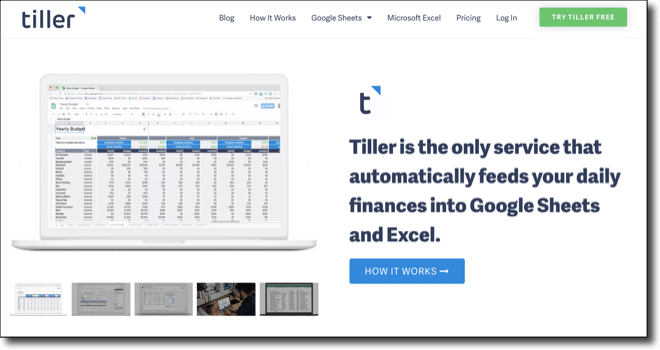 Tiller is an amazing tool that connects our bank accounts and credit cards securely to Google Sheets (or Excel), and automatically updates them on a daily basis. It means we can see all of our financial transactions in one place and do our own custom analysis in Google Sheets. It’s been transformative for our family’s sanity and helped us get on top of our spending and hit our saving goals. 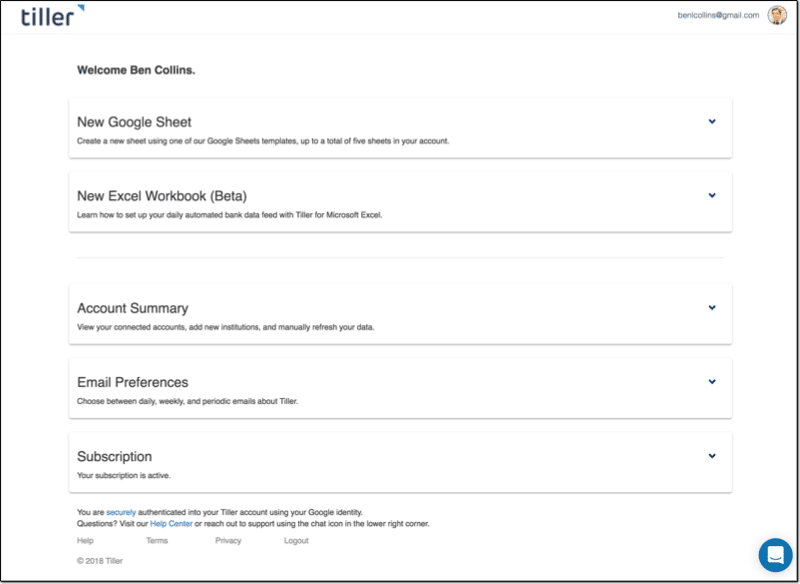 Tiller has a suite of Google Sheet templates available too, covering spending, saving, budgeting and net worth tracking, so that you can visualize your financial data immediately. Of course, you can also build your own solutions to answer whatever questions you have. It costs $59/year, which is tremendous value since you’re getting a fully customizable, automated personal finance tool. Tiller is a third-party tool so you have to create an account with them, which is done securely through your Google account credentials. After a short while, you can click over to your new Google Sheet, populated with all of your transaction data! We’ve setup categories to group our transactions, so that we can see how much we’re spending on different things at a high-level. For example, we group all restaurant expenses together into an “Eating Out” category, which allows us to see how much we spend eating out. You want enough categories to differentiate items in a meaningful way, but not too many that you end up with too much granularity. The whole idea is to summarize transactions into something more manageable. You can even use Tiller’s new Autocat tool to now automatically categorize transactions for you. I’m going to share our solution for tracking our spending habits. It allows us to understand how we’re spending our money and identify ways to reduce it. I created a summary table in our Tiller Google Sheet, which shows our family spending by category. It takes the data we’ve categorized in the transactions tab, which is automatically updated by Tiller, and summarizes it. The transactions are summarized by categories in the rows, and by months across the columns. Columns A and B contain checkboxes, which I use to control which spending categories to show in my charts. This table alone gives us more insight into our spending habits than anything the bank gives us. Every single transaction is included and categorized, by us not the bank. You can create a table like this with the QUERY function, or using a Pivot Table. I added the checkboxes in columns A and B, so there’s a way for my wife and I to choose categories to focus on. The checkboxes can be individually checked or unchecked and they feed into other data tables that only show the data for the checked items. However, seeing our discretionary spending — things like travel and eating out for example — helps us understand our spending habits and find ways to save more money in a healthy way. 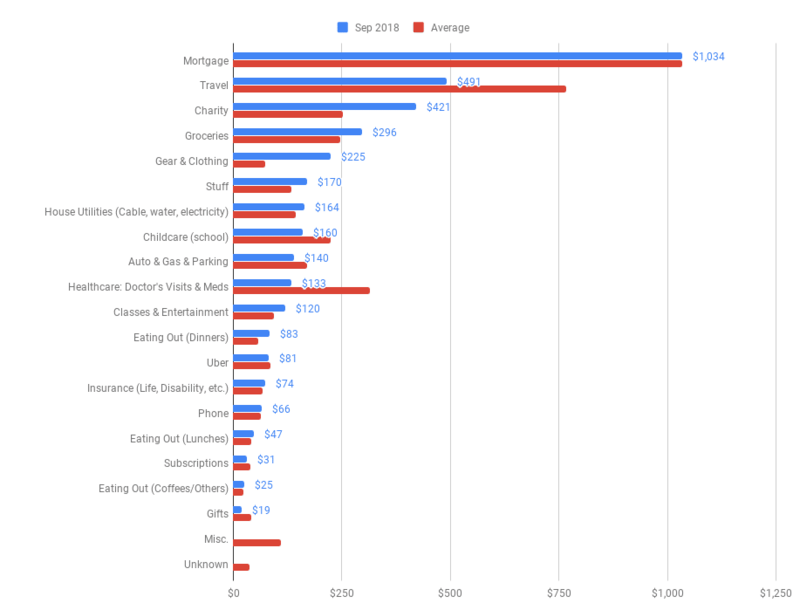 The combination of the monthly category breakdown table and these two simple charts gives us tremendous insight into our spending habits. Knowing how we’re spending our money gives us tremendous peace of mind. It’s helping us to minimize our unnecessary spending and maximize our saving. Note: I’m not a financial expert and this post does not provide financial advice. It simply shows some techniques for working with and presenting data in Google Sheets. I hear you on this one. I have felt the same way about online banking systems. Therefore, I did like you and I created a totally killer Google Sheets system for my family’s personal finances. I don’t use Tiller (definitely going to check that out), so I do download and import, but I have build such a great workflow and data cleansing process that it takes no time at all. Hardest, most time-consuming part is reconciling between my Sheets system and the bank. I even have a front-end dashboard in Data Studio so my wife can toggle date ranges and filters without having to give her the Sheets file at all. Do you have any concerns about keeping your financial data in Google Sheets given their EULA? Tiller have an Excel connection now too, so you could create a similar system and avoid the issue. Love it – put 15 accounts in it in under 30 minutes – it even pulled in our PayPal bill pay transactions – every account I needed was available. I have done this manually for over 10 years – never found one that was spreadsheet based until this. THANK YOU. Quick question for you Ben. Which template did you go with and/or did you just use the raw data and create your own? Tiller looks pretty awesome, I’ll have to check it out! This looks like a great tool. Do you know if this is compatible with multiple banks and multiple accounts? i.e. If I have my accounts (ck and sv) with Citi and my wife is with Wells, can I pull in checking and savings from each entity under the $59 subscription? Any idea if this works with AMEX as well? That would be a real time saver for me. Yes, it’s compatible with multiple bank accounts under the $59 subscription. When you create the Sheet you can just select which accounts to add into that specific sheet, from the shortlist of all your accounts. As for AMEX, I’ve asked Tiller and I’ll get back to you! Yes, Tiller let me know it’s compatible with AMEX. Great tip, Ben. Love your work! I’ll definitely have a look at Tiller though I doubt that it’ll work with Swedish banks. Maybe off topic but do you know of a way to pull data from a logged in service. I use a car-pooling system and I would love to pull data directly to a Google Sheet rather then copy/paste but I can’t work out how. I’ve tried the IMPORTHTML but it doesn’t work, probably because it’s a service that I log in to rather then just an open web page. Any other ideas? It does work with many international accounts, although they don’t directly support them. Could always drop them a line. The IMPORT function can’t grab data behind a login service, so you’re out of luck there. Does the service have an API? In which case you can write code (Apps Script) to access your data, or possibly use a third-party tool to do that. Does it work for Indian banks too? I don’t know specifically about Indian banks. It does work with many international accounts though, although they don’t directly support them. I have used Moneydance since it first came out in the early nineties. However, a Java application which have to load 20 years of data at startup and make a backup copy at shotdown become rather slow at starting up and shotting down. So I tested Tiller, but failed to connect to neither my Canadian account at CIBC nor my Danish account at Nordea. So now I attempt to convince Nordea (Denmark), that Tiller is a good tool to use for data export. Currently the only export facility Nordea (Denmark) provide is csv-files, which then have to manually imported into Google Sheet. Moneydance in the past provide excellent import of share and bond prices from Google Finance. I wonder if it is still possible to import Google Finance data into Google Sheets? Any chance you could make your spreadsheet available? I like some of your tweaks more than the templates that are available through Tiller. Thanks for sharing this with us. I’d like to second Johannes request. Would you be willing to share a version of your spreadsheet with dummy data for us? 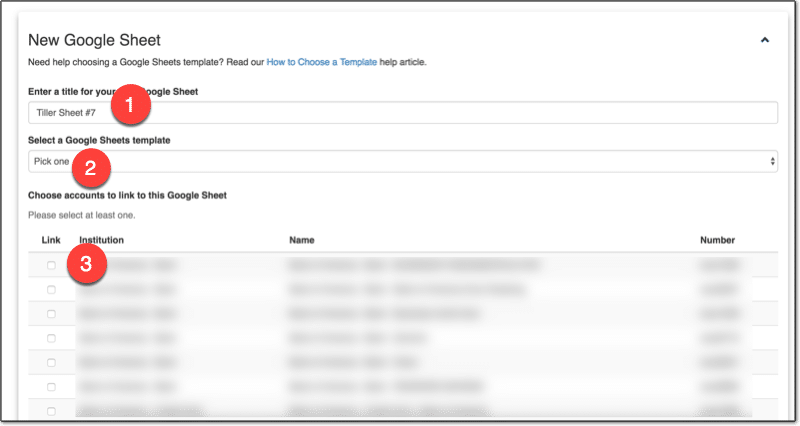 I’m a Tiller subscriber myself and it would be really helpful to me to see exactly how you are generating the summary table and two charts.